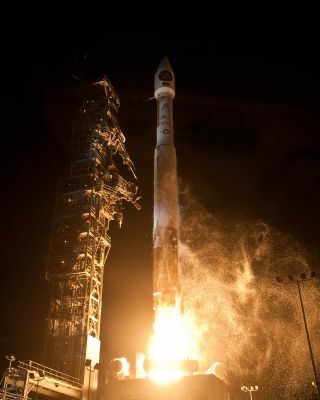 A United Launch Alliance Atlas 5 rocket blasts off from Space Launch Complex-3 at 9:24 p.m. PDT on April 14, 2011 with the classified NROL-34 satellite for the National Reconnaissance Office. A rocket carrying a new U.S. spy satellite lit up the California night sky Thursday on a secret mission for the National Reconnaissance Office. The spy satellite NROL-34 soared into orbit atop an unmanned Atlas 5 rocket after launching from a pad at the Vandenberg Air Force Base at 9:24 p.m. PDT (0424 GMT on April 15) to begin the latest classified flight for the NRO. "This launch supports the military's national defense mission," officials with the United Launch Alliance, which orchestrated the satellite launch for the NRO, said in a mission description. Because of the satellite's secret purpose, a media blackout was put in place about 4 1/2 minutes after the Atlas 5 rocket launched toward orbit. The rocket lifted off with the help of a single solid rocket booster to propel it into space. Thursday's liftoff was the sixth satellite launch for the NRO since September – a series of secret missions that lifted off from pads at Vandenberg and the Cape Canaveral Air Force Station in Florida. Several types of expendable rockets, including Delta, Minotaur and the Atlas boosters, were used for those missions. "Six launches in this time is the most aggressive launch schedule for the NRO in two decades," said ULA launch commentator Don Spencer in a webcast. Thursday night's liftoff marked the fourth rocket launch of the year for the United Launch Alliance and the 25th flight of an Atlas 5 rocket since the booster's debut in 2002.